Yet again, I have been contacted by someone with a past connection to the Puffin Club – to be honest this happened last year, but now I have something to share! The artist and illustrator Jacqueline Atkinson who illustrated the strip ‘Canny Blockhead’ and produced many pieces of artwork for the club, has kindly sent me some selected pieces from her archive. One of the sets of drawings are the original plans for a mural that was realized at the Puffin Exhibition. 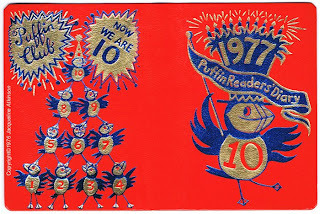 The first treat from Jacqueline’s archive is the cover she produced for the 1977 Puffin Readers Diary. I believe that she and Jill McDonald were the only artists to produce covers for these little gems (but I would love to hear if I am horribly wrong). Look forward to the re-emergence of ‘Canny Blockhead’ in future postings.